There is no better way to observe polar bears hunting in their natural environment of frozen snow and ice than with this Big Animals expedition to our polar north. There is only space for two guests and we like to keep it this way for a variety of reasons. Overcrowding is a chronic problem for photographers looking to capture natural animal behaviors and unique images, and our small expedition size ensures that will never be an issue. it also means that each guest will have a uniquely personal experience and the absolute best chances possible to capture rare images and footage of polar bears hunting. There's no adventure more amazing than Polar Bears in Norway. 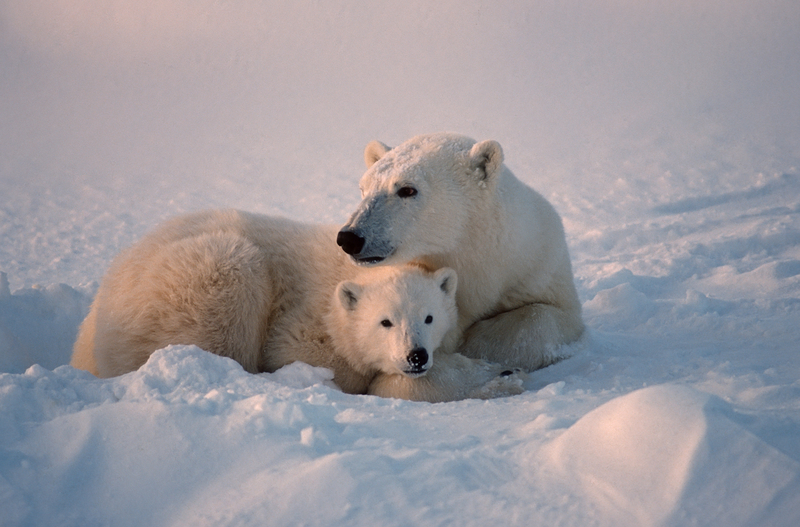 The experienced polar bear tracker and professional wildlfie photographer guide will coachyou to photograph beautiful, rarely-seen behavior in the polar bear life cycle. Fly into Longyearbyen Svalbard and transfer to our 5 star designated hotel. Day 2: Early morning move to “staging area” check all our cold weather gear. have a fast course in snow Mobile driving; pack our personal, cameras and team gear, fuel, and food on sleds. There are two main areas for shadowing and filming polar Bear. Both areas are strict control, and permit required. The selection which area will be prime for photography to be decided at the time of our arrival. Based on the selected zone of operation our accommodation will be either at hunter huts or in the reviving Russian hotel style, equal to half star…heated, no water and limited food. Days 3 – 6: Polar Bears! Everyday our experienced guide (they are the best the field leading the BBC, NG and other Tv productions) will decide which hours we shall operate morning or afternoon, following other guides report…we shall go for 10 to 14 hours daily, in search and shadowing female with her one or two cubs. We stop on the way for quick camping style meals and hot tea, while we continue searching…When we spot a bear family, the guide will instruct us on the next step, either we move together or we move our camera gear on one sled, leave our vehicle behind climb on the guide sled and get close and as quiet as possible to the Bear…assemble our tripod and camera and wait quietly and with lots of patience…we will do it few times a day till we have our moment. After day in search and hopefully few good sighting we start making our way back to town Longyearbyen. Return our borrowed clothing gear and the trusted snow mobile that served us so well. After good shower in hot water, we meet for farewell dinner at your 5 star hotel. Transfer according to your flight to airport for you next destination.